It started, as things often do nowadays, with a tweet. As part of a discussion of networking-fu I mentioned ProxyARP, and that it was no longer used. Ivan Pepelnjak corrected that it did still have a use. He wrote about it last year. I've tried to understand it, and wrote this post to be able to come back to later to remind myself. Thats it, right? You always configure an IP address plus subnet mask. The host will ARP for addresses on its subnet, and send to a router for addresses outside its subnet. Yet it wasn't always that way. Subnet masks were retrofitted into IPv4 in the early 1980s. Before that there were no subnets. The host would AND the destination address with a class A/B/C mask, and send to the ARPANet for anything outside of its own network. Yes, this means a class A network would expect to have all 16 million hosts on a single Ethernet segment. This seems ludicrous now, but until the early 1980s it wasn't a real-world problem. There just weren't that many hosts at a site. The IPv4 address was widely perceived as being so large as to be infinite, only a small number of addresses would actually be used. Aside: in the 1980s the 10.0.0.1 address had a different use than it does now. Back then it was the ARPAnet. It was the way you would send packets around the world. When ARPAnet was decommissioned, the 10.x.x.x address was made available for its modern for non-globally routed hosts. There was a period of several years where subnet masks were gradually implemented by the operating systems of the day. My recollection is that BSD 4.0 did not implement subnets while 4.1 did, but this is probably wrong. In any case, once an organization decided to start using subnets it would need a way to deal with stragglers. The solution was Proxy ARP. Its easy to detect a host which isn't using subnets: it will ARP for addresses which it shouldn't. 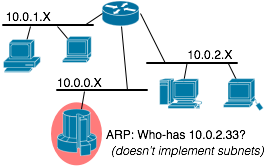 The router examines incoming ARPs and, if off-segment, responds with its own MAC address. In effect the router will impersonate the remote system, so that hosts which don't implement subnet masking could still function in a subnetted world. The load on the router was unfortunate, but worthwhile. That was decades ago. Yet Proxy ARP is still implemented in modern network equipment, and has some modern uses. One such case is in Ethernet access networks. Consider a network using traditional L3 routing: you give each subscriber an IP address on their own IP subnet. You need to have a router address on the same subnet, and you need a broadcast address. Needing 3 IPs per subscriber means a /30. Thats 4 IP addresses allocated per customer. There are some real advantages to giving each subscriber a separate subnet and requiring that all communication go through a router. Security is one, not allowing malware to spread from one subscriber to another without the service provider seeing it. Yet burning 4 IP addresses for each customer is painful. To improve the utilization of IP addresses, we might configure the access gear to switch at L2 between subscribers on the same box. Now we only allocate one IP address per subscriber instead of four, but we expose all other subscribers in that L2 domain to potentially malicious traffic which the service provider cannot police. We also end up with an inflexible network topology: it becomes arduous to change subnet allocations, because subscriber machines know how big the subnets are. As DHCP leases expire the customer systems should eventually learn of a new mask, but people sometimes do weird things with their configuration. A final option relies on proxy ARP to decouple the subscriber's notion of the netmask from the real network topology. I'm basing this diagram on a comment by troyand on ioshints.com. 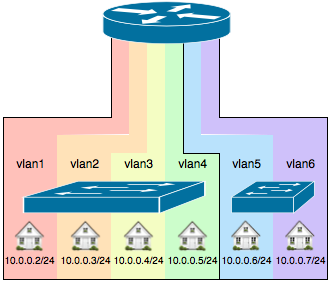 Each subscriber is allocated a vlan by the distribution switch. The vlans themselves are unnumbered: no IP address. The subscriber is handed an IP address and netmask by DHCP, but the subscriber's netmask doesn't correspond to the actual network topology. They might be given a /16, but that doesn't mean sixty four thousand other subscribers are on the segment with them. The router uses Proxy ARP to catch attempts by the subscriber to communicate with nearby addresses. This lets service providers get the best of both worlds: communication between subscribers goes through the service provider's equipment so it can enforce security policies, but only one IPv4 address per subscriber. Until this week I thought Twitter would focus on datamining the tweetstream rather than adding features for individual users. I based this in part on mentions by Fred Wilson of work by Twitter on analytics. I've been watching for evidence of changes I expected to be made in the service, intending to write about it if they appeared. Earlier this week came news of a shakeup in product management at Twitter. Jack Dorsey seems much more focussed on user-visible aspects of the service, and I'm less convinced that backend analytics will be a priority now. Therefore I'm just going to write about the things I'd been watching for. To reiterate: these are not things Twitter currently does, nor do I know they're looking at it. These are things which seemed logical, and would be visible outside the service. Wrap all links: URLs passing through the firehose can be identified, but knowing what gets clicked is valuable. The twitter.com web client already wraps all URLs using t.co, regardless of their length. Taking the next step to shorten every non-t.co link passing through the system would be a way to get click data on everything. There is a downside in added latency to contact the shortener, but that is a product tradeoff to be made. Unique t.co per retweet: There is already good visibility into how tweets spread through the system, by tracking new-style retweets and URL search for manual RTs. What is not currently visible is the point of egress from the service: which retweet actually gets clicked on. This can be useful if trying to measure a user's influence. An approximation can be made by looking at the number of followers, but that breaks down when retweeters have a similar number of followers. Instead, each retweet could generate a new t.co entry. The specific egress point would be known because each would have a unique URL. Tracking beyond tweets: t.co tracks the first click. Once the link is expanded, there is no visibility into what happens. Tracking its spread once it leaves the service would require work with the individual sites, likely only practical for the top sites passing through the tweetstream. Tracking information could be automatically added to URLs before shortening, in a format suitable for the site's analytics. For example a utm_medium=tweet parameter could be added to the original URL. There might be some user displeasure at having the URL modified, which would have to be taken into account. Each of these adds more information to be datamined by publishers. They don't result in user-visible features, and I suspect that as of a couple days ago user-visible features became a far higher priority. My current project relies on a large number of XML Schema definition files. There are 1,600 types defined in various schemas, with actions for each type to be implemented as part of the project. 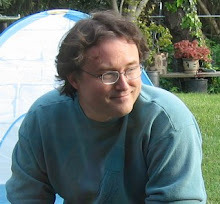 A previous article examined CodeSynthesis XSD for C++ code generation from an XML Schema. This time we'll examine two packages for Python, GenerateDS and PyXB. 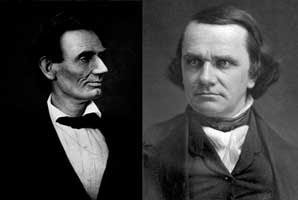 Both were chosen based on their ability to feature prominently in search results. In this article we'll work with the following schema and input data, the same used in the previous C++ discussion. It is my HR database of minions, for use when I become the Evil Overlord. The Python ElementTree can handle XML documents, so why generate code at all? One reason is simple readability. A more subtle reason is to catch errors earlier. Because working with the underlying XML relies on passing in the node name as a string, a typo or misunderstanding of the XML schema will result in not finding the desired element and/or an exception. This is what unit tests are supposed to catch, but as the same developer implements the code and the unit test it is unlikely to catch a misinterpretation of the schema. With generated code, we can use static analysis tools like pylint to catch errors. The generated code is in minion.py, while minionsubs.py contains an empty class definition for a subclass of minion. The generated class uses ElementTree for XML support, which is in the standard library in recent versions of Python. 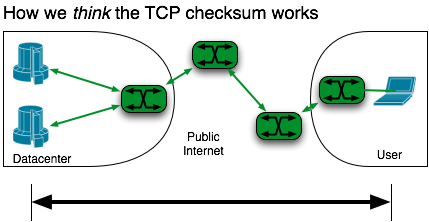 The minion class has properties for each node and attribute defined in the XSD. In our example this includes name, rank, serial, and loyalty. The generated code is in minion.py. The PyXB file is only 106 lines long, compared with 548 lines for GenerateDS. This doesn't tell the whole story, as the PyXB generated code imports the pyxb module where the generateDS code only depends on system modules. The pyxb package has to be pushed to production. Very much like generateDS, the PyXB class has properties for each node and attribute defined in the XSD. A primary reason for this exercise is to catch XML-related errors at build time, rather than exceptions in production. I don't believe unit tests are an effective way to verify that a developer has understood the XML schema. To test this, a bogus 'm.fooberry' property reference was added to both test programs. pylint properly flagged a warning for the generateDS code. pylint did not flag the error in the PyDB test code. I believe this is because PyDB doesn't name the generated class minion, instead it is named CTD_ANON with a runtime binding within its framework to "minion." pylint is doing a purely static analysis, and this kind of arrangement is beyond its ken. As a primary goal of this effort is error detection via static analysis, we'll go with generateDS. Apparently Alyssa Milano used her Twitter account to verify her Google+ account. XFN 1.1 defined a number of relationship attributes for links, one of which is rel="me"
rel="me" A link to yourself at a different URL. Exclusive of all other XFN values. Required symmetric. There is an implicit "me" relation from the contents of a directory to the directory itself. Clearly, we need rel="me twitter" for situations like this. Machine translation has improved so much that we can now joke about it, pointing and laughing when it comes up with something particularly inane. I do mean "improved so much" - ten years ago the results on arbitrary text were so incomprehensible that they weren't even amusing. Statistical machine translation is a big data approach to the problem, looking for statistical correlations in the way humans translate between languages. It radically improved the results compared to trying to get the machine to understand grammar, at least when there is sufficient data available. Which brings us, of course, to Star Trek and the Universal Translator. As a plot device, the translator is essential: you either portray alien species as inexplicably speaking human languages, or you employ a magical device to learn the alien language and translate. One of my favorite episodes revolves around the limitations of the device: Darmok. The translator can translate works with individual words and phrases, but cannot translate metaphor and cultural references. "Darmok and Jalad at Tanagra." "Zinda, his face black, his eyes red!" Ever notice how many cultural references we use in everyday conversation, as a shorthand to convey deeper meaning in a small number of words? I tried to keep track of them for a week. Its difficult to even take note of the ones you employ yourself: the mind doesn't categorize them as being special, they're just another part of the language. They are mostly noticeable when someone else uses an unfamiliar reference that you really have to think about. "Multiplying like a wet gremlin." "Use the carrot, not the stick." "He was the red shirted ensign of that project." "That is Kryptonite to her." "He has a portrait up in the attic getting older and older." An interesting thing about statistical translation is that it is even able to handle references like these, if they are sufficiently common. Its looking for correlation, not meaning. If humans can come up with a reasonable translation for a cultural reference, then the machine will as well. This doesn't help Picard, though: no data corpus to work with.